What does a panther and an ankylocroc have in common? Really very little. But the ankylocat is what happens when you smoosh their likenesses together. aka the catosaur. I was hoping to bring new light to old species. The eggs, like the adults, are covered in a gradient of bony plates that run down into spots and scales. Individuals range from green-brown to brown-grey, with a lighter underside rimmed in thin fur. No two individuals have the same arrangement of spots, plates, and spikes, leading to a great variety of appearances. Despite its jagged and cumbersome form, it has an uncanny ability to sneak. Compared to males, females typically have more than one array of large spikes, and a bit more fur around the edges. Having less armor weighing them down, males tend to be more acrobatic - not always a good thing. After lolling in the sun, it has a period of playful curiosity. Being accidentally snagged with a tooth or claw is always something to be mindful of. It is also possible to have a finger crushed between the jutting spines of a wiggling cub. 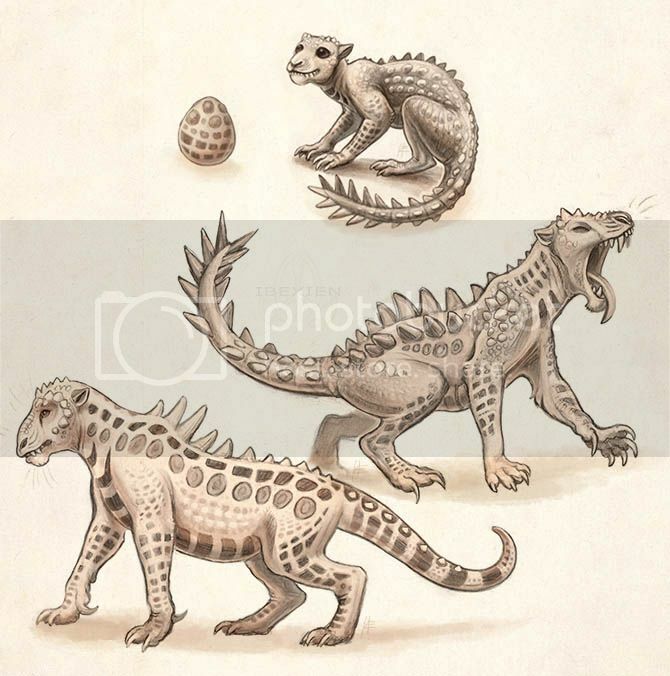 The skull is built more like that of a synapsid than either a feline or archosaur, and it is unfortunately quick to snap at things which move too fast in front of its nose. Larger than any natural panther, its creation should only be attempted by magi who are both experienced with hybridization, beast training, and protection spells. Also it enjoys being petted behind its shrunken ears. This is gorgeous Amp! Very well done. I love the thought towards bringing light to older species. The detail and the drawings are amazing too.